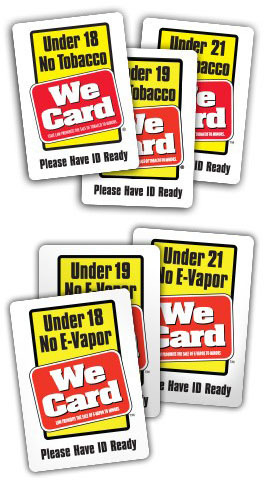 Back in November, The We Card Program started getting some inquiries from retailers about federal, state and local legal ages to sell tobacco and vaping products. We thought it would be a good time to reinforce this knowledge. Your state or local laws regarding the minimum-age to sell tobacco and vaping products supersede the Federal regulation’s (see page 13) minimum-age of 18 years old. If your state has a higher minimum-age, oh say you live in California, the minimum-age to sell tobacco and vaping products is 21. And lots of other states and localities have minimum ages higher than the federal regulation. 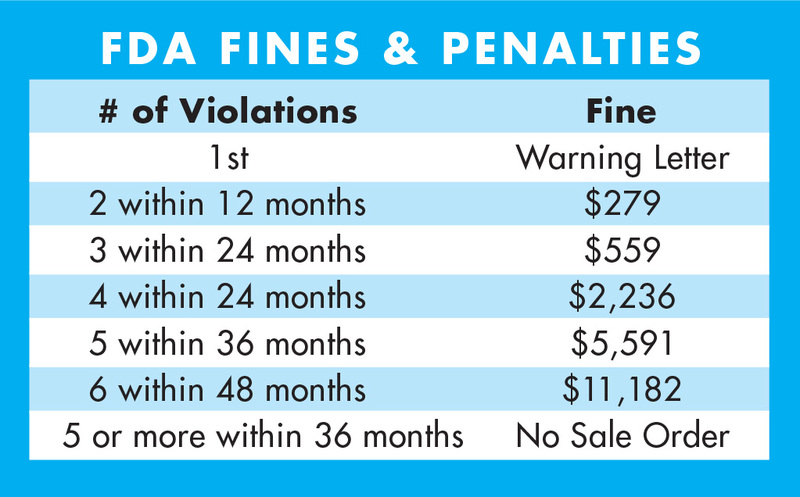 We’ve heard from retailers after FDA launched the “This is Our Watch” Program which includes materials that reinforce the Federal Regulation’s 18 year old minimum-age including an age of purchase calendar. In a short survey we conducted in January, we found that a number of retailers in states and localities where the minimum-age to sell is higher (19 or 21) were still planning to use the FDA’s 18-year focused age-of-purchase calendars and other materials. Compliance Advice: Don’t use 18-year calendars or materials if your store(s) are located in states or localities with a higher minimum-age. And if you haven’t checked on the latest state-required signage, we encourage you to do so. Each state may have some type of state sign that it requires at retail (some states require language and do not provide a sign). We try to keep track of this and offer a guide here in our website’s Resource Center (free log-in required). Meanwhile, the FDA will conduct another 160,000 or so random unannounced inspections in 2018 to see if retailers are complying with laws on the sale of tobacco. And there’s a good chance your store will be checked. Follow our short checklist below to make you have all the training and tools in place to ensure you pass the next enforcement check and don’t end up with stiff penalties and subsequent court proceedings. Step 1: Double check what tools and signage you are using in-store right now, and make sure it matches your state or local law’s minimum-age requirement. Check We Card’s listing of state and city/county minimum-age requirements. If your city or county is listed, then it has a higher minimum-age than your state. We update our list as soon as we learn of a change, but please contact us if we’ve missed your locale. We Card’s 2018 Calendar – The standard bearer of tools, the We Card calendar is available in versions suited for 18, 19 or 21 years old. We Card’s new Age Checker App – is available in the App Store right now. This iPhone app scans driver’s license bar codes, calculates customer’s ages and provides “OK TO SELL” or “DO NOT SELL” messages for tobacco, vaping products and alcohol using your store’s state or local law minimum-age requirements of 18, 19 or 21 years old. Android version coming soon. 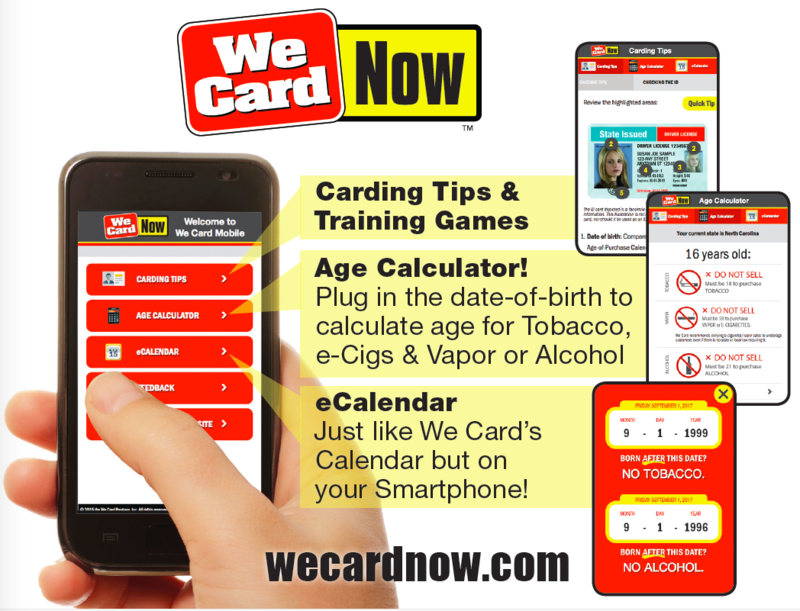 We Card’s mobile site – wecardnow.com has two age calculation tools using your store’s state or local law minimum-age requirements of 18, 19 or 21 years old. Age Calculator: Another great tool to use when carding a customer. 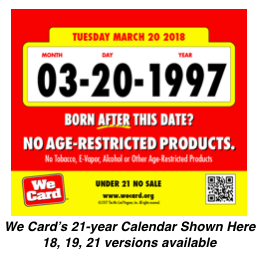 This one calculates exact ages when you enter a customer’s date-of-birth and it indicates whether it’s “OKAY TO SELL” or “DO NOT SELL” for Tobacco, Vapor and Alcohol products. Very handy and it’s state and city/county specific with the minimum-age requirements of 18, 19 or 21 years old. Your employees need to be equipped so that they’re “trained-and-confident” in understanding what’s expected of them. 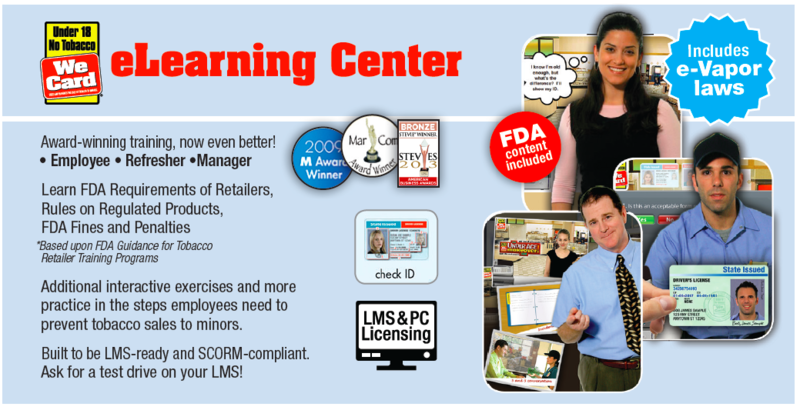 We Card’s training is state-law specific, highly interactive and provides practice and role-playing in a variety of customer scenarios – including calculating a customer’s age and determining whether to politely deny a sale or properly make a sale – with programmed 18, 19 or 21-year state law variables so you know employees are getting the proper training. All 21-year minimum-age states have required state signs – California, Hawaii, Oregon & New Jersey. For 19-year minimum-age states, Alabama & Alaska have required state signs. Find out how to get your state-required signs at We Card’s Resource Center online at www.wecard.org (a free log-in area). 2. 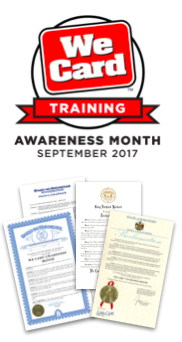 Supporting your employees (and reminding them) to “card,” identify minors and deny their attempts at purchasing age-restricted products. President, The We Card Program, Inc.